Washing the Lammie… sounds like a euphemism, or is that just my mucky mind? Anyway here’s a nice little vid, selling t-shirts, and I can’t think of a better way of selling them than getting an attractive young lady to wear one while washing a Lambretta. Brought to you by the guys at Scooterist. 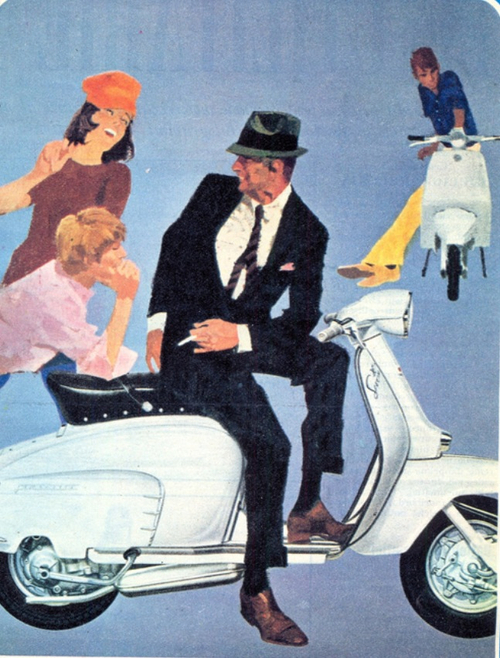 I find it amazing how countries around the world have adopted the scooter scene ethic… often with the same music and fashions as those originally found in the UK. I know the scooters are Italian, and the music is Jamaican, but the culture is pure British. Except it’s not. It’s GLOBAL. As this video from Bogota (that’s in Colombia, South America for all you geography dunderheeds). And I think it’s pure brilliant. BTW, As well as Colombia, this blog has readers in Venezuela, Brazil, Peru, Chile, Uruguay and Argentina. Most of South America in fact. So if you own, ride, or are just interested in Lambrettas and you live in Guyana, Surinam, French Guiana, Bolivia or Paraguay… please get in touch, send some pics, let me know what’s happening in your neck of the woods. There are a few places around the world untouched by the “Lambretta virus” but, as I’m finding out… not many! With the sad demise of Posterous, the ‘platform’ which got me started on blogging in the first place, I had to look round for alternatives. WordPress seems the way to go… so here I am. All the old content from the Posterous site should import later… and things might look a little different around here… but rest assured it will still be dedicated to “the world’s finest motor scooter” The Lambretta.